Do you live in Sandton? Iba-Umngani Foundation Reviewed by: Kerry Pathetic, I did some gift wrapping this during December for Margaret. After all my hard work and long hours, she refuses to pay me my dues like she promised. I think this is so wrong! Essaldoor Distribution Reviewed by: Anonymous This phone number belong to a private house and not to this company. Sandton is an affluent area situated within the metro of Johannesburg, Gauteng, South Africa. The name comes from the combination of two of its suburbs, Sandown and Bryanston. In 1969 Sandton was promulgated as a municipality in its own right, but lost its status as an independent town after the re-organisation of South African local governments. Archaeological findings suggest the area, which Sandton comprises today, had originally been occupied by various indigenous groups, before European settlement. Most notably the Tswana people. The first of the Voortrekkers to settle in the area were those of the Esterhuysens of Zandfontein. A monument to commemorate them may be found just off Adrienne Street. In the 1870s the Wilhelmi family of Hanover, Germany acquired the farm Driefontein No.3. Driefontein along with the farms Rietfontein and Zandfontein encumbered what is today Sandton. Their original home, now within the confines of the Field & Study Centre, was looted during the Anglo-Boer War. Their 1906 Parkmore farmhouse served as the icon for the Sandton Historical Foundation. The Ehler family owned Rietfontein farm. The municipality was established as an extension of the city in 1969, after Johannesburg began to expand northwards. Initially it was very much a residential area consisting mostly of small holdings. This rural "horsey" lifestyle of Sandton gave it the image of being a smart address. It was dubbed the "mink and manure" belt of Johannesburg. After the demise of apartheid and the manifestation of the new political dispensation, Sandton first became part of the Eastern Metropolitan Substructure, and later became part of the City of Johannesburg Metropolitan Municipality following new demarcations put forward by the government, and it no longer has a separate municipal government. One of the main attractions in Sandton is Sandton City, which ranks among the largest shopping centres in Africa. Together with Nelson Mandela Square, the centre, with some 144,000 m2 of shopping space, is one of the largest in the Southern Hemisphere (behind Chadstone Shopping Centre). Much of Johannesburg's business tourism is centred on Sandton, which has a string of 5-star hotels. It was recently announced by Liberty Properties that Sandton City will receive a R1,77-billion upgrade. Liberty Properties chief executive Samuel Ogbu has envisaged the complex as South Africa's very own Wall Street "Africa is not for sissies, but we have a bold vision, which is to see the Sandton City precinct as our own Wall Street." The redevelopment will include the construction of a 60-storey office tower, a new hotel, new retail and office space and residential apartments. The 60-storey office tower will be the tallest building in Africa, replacing the Carlton Centre in Johannesburg CBD. The extension will stretch to 30 000 m2 and the total complex will have a gross lettable area of 158 000 m2 . London-based RTKL Associates have been chosen to design the complex. Nelson Mandela Square, formerly known as Sandton Square, was renamed in March 2004, after the unveiling of a 6-metre bronze statue of the former South Africa president. Perhaps ironically, Liliesleaf Farm, where Nelson Mandela lived in the early 1960s and where many leading political activists were arrested in 1963 and tried as part of the now infamous Rivonia Trial, is just north of Nelson Mandela Square, close to the N1 Highway, off Rivonia Road. 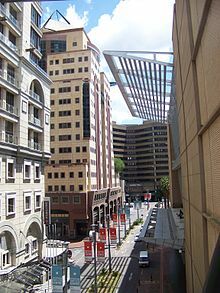 Sandton is often cited as a materialistic centre and refuge of the white flight from the Johannesburg CBD. Following the launch of Sandton Magazine, the town was satirized in a tongue-in-cheek satirical news story by Hayibo.com that was also published on the Sandton Magazine website. The headline comically read "Sandton magazine hailed as just what rich whites need." There is reference to the requirement of two wealthy young white people on the cover "to help frightened Sandtonians forget about Alexandra township next door." The spoof also uses the magazine's marketing slogan when "four Mozambicans wandered into the ballroom apparently in search of the good life in the great north." These Mozambicans are "tazered," a reference to the advanced crime-fighting technology in the suburb. The materialism is heightened with imaginary article headline "Botox your Botox: why your face can never be paralysed enough." The fears of a Zuma presidency are reiterated "Ten Zuma-proof off-shore investments you can hide from the taxman." The high rates of white emigration and fears post-2010 are also satirized "Likewise, should we be looking at Perth or London post-2010?." Ultimately, security and material items are cited as the solution to any problem in the country "We want to remind people that there is no problem this country can throw at you that you can’t solve with electric fencing and a pedicure." Former Sandton resident and author, Sarah Britten cites the town regularly in her book The Art of the South African Insult. She cites the popularity that the town also holds with the growing black middle-class "Empowerment kugels don't hang out in Soweto; they do lunch in Sandton" and quotes columnist Therese Owen's advice to former TV-personality Kedibone, "Now that you're no longer wanted as a continuity presenter on SABC1, go hang out in Sandton and catch yourself a BEE boy." She also references a commentator on Moneyweb, "Sandton is attractive to the schmucks of this world—get over it—$s don't buy class." The Sandton area is one of the most opulent in Johannesburg and South Africa, and therefore in Africa. Due to the shortage of available land, the trend in new developments is to go skyward. This is evidenced by the new 140-metre tall Michelangelo Towers, which purports to offer Manhattan-style living in Johannesburg. The new apartment block will be the fourth-tallest building in Johannesburg and local newspaper the Sunday Times reports that the top-selling penthouse apartment was sold for R28 million (around $4 million). Concerns have been raised as to whether Sandton has the necessary road and water infrastructure to sustain the massive development that is characteristic of Johannesburg in the 21st century (since the demise of Apartheid and the Group Areas Act). By far the most prevalent form of public transportation in the area is provided by minibus taxis. The main taxi rank is to be found on West Street. Although not as popular an option as is the case in other major cities, metered taxis can be used to commute to and around Sandton.